Josh Steimle quit his job in college to build an digital marketing agency, then decided to pack up his family and move to Hong Kong. This is the perfect example of an entrepreneur that took the bull by the horns and created a lifestyle business that, as Josh says, leaves everyone happy. 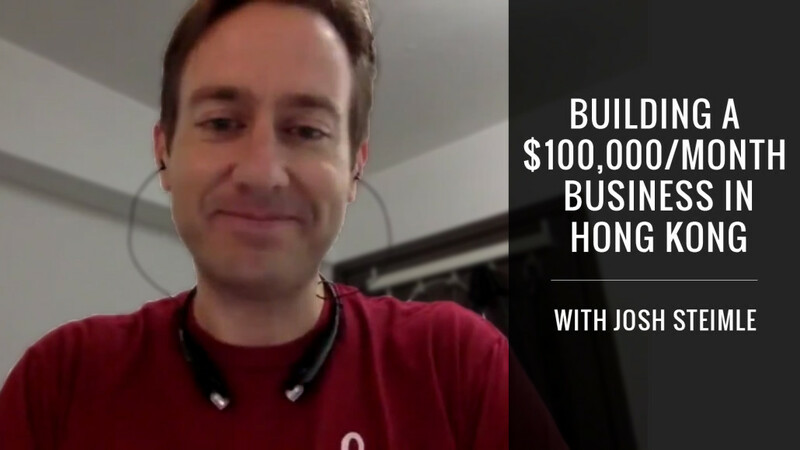 A couple years ago, Josh’s business unraveled and he lost most of his customers and revenue. Then he pushed through and is now generating over $100,000 a month. Chris: Hey everybody. We are back with another great interview and today I have Josh Steimle on the line. He’s the founder of MWI which is a digital marketing agency that he founded back in, I believe, 1999. Is that correct Josh? Chris: Awesome. I know you're also a writer for Forbes and you write about start-ups on entrepreneurship. What did I miss? What else would you like people to know about you? Josh: Well, I'm also a dad. I have two kids and I'm married and I'm into trail running, skateboarding. I still think of myself as an artist. That’s what I originally set out to do before I started a business. I grew up wanting to be an artist and a designer, then I got sidetracked and got into entrepreneurship and that became my passion. Chris: Nice, so you kind of fell into it. Now, where do you live? Do you live in Hong Kong? Josh: I live in Hong Kong. I’ve been here for about 2-1/2 years. Chris: Beautiful. I was actually there about a year ago, actually last December, and we had a blast. My wife loves the shopping there and I think it’s just a great place for business. What prompted you to move out there? Josh: Kind of non-traditional reasons. Most people move to Hong Kong because they got a job here. There are a lot of finance jobs going on here. There’s a lot of real estate. There’s a lot of business being transacted here in Hong Kong. It’s the gateway to China, that’s kind of its traditional role. But my wife and I, we moved here because a few years ago, we adopted our first daughter and then we started feeling like we wanted to adopt again and we started looking to China and we went there. As we are looking into this adoption from China, we just thought “Why don’t just move over there?” And so we started looking at moving to China but then we realized moving to China is a little bit much, maybe we should take a first step. From there, we started looking at Taiwan and Singapore and Hong Kong and we ultimately settled on Hong Kong and decided to move here. We hopped and moved. We brought our and moved here and it’s been great. Chris: That’s amazing. What year was that that you moved over there? Chris: Okay, so you started your company. You were living in the States at that time? Chris: Why not? It’s an adventure. Chris: Awesome. Take me back to your entrepreneurial journey. What prompted you to start MWI and I guess give us a little bit of a background on what your company does? Josh: Sure. So to really go back, I have always been into—you hear the story sometimes from entrepreneurs how when they were little kids they did things to make money, and that’s kind of how it started for me. I've just always been doing little things to make money here and now on the side. When I was in high school, I started a business selling skateboard stuff kind of a skate shop business, and at this time, I felt that I wanted to be an artist but then I went to college. While I was at college, I realized, wow you can study business. You can study entrepreneurship. I had no idea. I was totally ignorant that you could study this stuff. I thought people just started it but I never realized they studied it. While I was in college and I thought, “Wow, I want to get into this business stuff. This is what I really want to do.” And so I started studying business and then while I was in college which was in the late ‘90s, this was when the whole “dot com boom” was going on and I have picked up some web design skills and I got a job with a start-up in Provo, Utah called mycomputer.com and this is the company that became Omniture which got bought out for 1.8 billion by Adobe a few years later. I was there right when this company that became a unicorn was getting started. I was part of the original small team of 20 people or so and I just had this great experience there and I was like, “Man, I have got to start my own business. I can't stand being a worker, being in this company.” I wanted to start something like this. I was looking at the head guys, the founders, and I thought they're having so much fun, at least that looked like fun to me, and so I have been married for about 4 months and I told my wife, “I'm going to quit my job and start a business.” She’s like, “Well, we’re college students. We’ve got nothing to lose. Sure let’s go ahead.” So we started a business in 1999 and this has been the only job I've been able to keep more than 5 months. Chris: Okay, so you quit your job in college. What year were you in college? Josh: I was in my junior year, so I had about 2 years left of college. I did a masters degree in information systems management, so I was working on an integrated degree when I started my business. Chris: Okay. You started it, how did it go for the first few years? Was it instant success or did it take a lot of hustle and work and struggle? Josh: It was instant failure and then it was a lot of struggle and I'm still working on that success part. When I started the business, I had this idea that you started a business and then people just came and they hired you. So I started doing web design, that’s what I knew how to do. I was doing freelance web design out of my apartment and I just thought, “Yeah, I’ll throw up a website and people will come hire me.” And I threw up a website and I quit my job and nobody hired me, and I realized, “Wow, I need to learn something about marketing here” But things worked out and slowly I would get a client here, get a client there, and then it grew and then I hired people, and it grew more. Then, as it turns out, entrepreneurship is a little more complicated and so there are a lot of ups and down over the years but it’s worked out. Chris: That’s great. It’s really nice that you got to stick with that and you didn’t give up through the struggle. I feel like so many entrepreneurs just give up after a few months or a couple of years of just tough work and not seeing the success that they want. Where are you today? Let’s fast forward. What kind of revenue are you generating? Where are you guys at? How many employees and what does your business look like? What kind of services or products do you have now? Josh: Right now, we’re a boutique agency. We have about 12 employees. We do somewhere around $1.3 million in revenue right now. But to give an accurate picture, we actually went through a tough time about 2-1/2 to 3 years ago right before we moved to Hong Kong where we almost went out of business and we were down to maybe $10,000 a month in revenue. We lost all our clients. We really had a bad spot there and so we came back from that and now we’re up to somewhere a little bit over $100,000 in revenue. I don’t know off hand because we closed $30,000 new recurring revenue last month and so I don’t have the latest figure. But we came back from that and so now the business is growing again quite rapidly, and so I'm hoping that a year from now we’re doing around $3 million in revenue. Chris: What kind of services are you providing to get that revenue? Josh: Part of our business is web design. We design and we build websites but most of our business is focused around marketing. It’s search engine optimization. We manage paid search campaigns for our clients. We do contact marketing, so we’re blogging, we’re writing content, we’re developing infographics. We do social media and marketing, so we’re setting up social media campaigns, managing those for our clients. Ultimately, we are a lead generation firm. The client comes to us when they need sales, they revenue, they need growth substantially. We’re kind of a company for growth hackers. Essentially, we figure out who to help companies grow. Chris: Nice. Are you working with early stage start-ups that have raised capital or solo-preneurs, lifestyle entrepreneurs, small businesses? What’s the kind of your bread-and-butter client? Josh: Our bread-and-butter is a more established business. We do work with some start-ups, but because of the rates we charge, a lot of start-ups can't afford what we do and so we tend to work with more established businesses that are a little bit further along the start-up, although we do have some start-ups as clients. We work with all types of companies. We’ve got everything from self-storage companies, to dentists, to law firms, to large insurance companies. We have a client called Beard Brand that they sell beard oil. I didn’t even know there was such a thing. I can't really grow much of a beard myself but you’ve got these hipsters out there and you got these guys who grow those thick beards and apparently they need beard oil and this company sells a ton of beard oil and we help them sell that. Chris: That’s not the Dollar Beard Club is it? Josh: No, it’s not that but it’s that type of thing. It’s really a unique fun business to be working with. Chris: Nice. Let’s go back to whenever you guys almost went out of business. I always find those stories really interesting and you seem like a really tenacious guy. You hustled through college, you quit your job, you started a company, you struggled and now you have a 7-figure business and what happened to take you guys down to $10K a month and what did you do to get you back up to where you are today? Josh: The issue that we had is that we had a model. Well, I had a model for a while before I brought on my partner. I had a model where I have had a business with 10 employees and we were doing okay but we have a lot of struggles. We’re bringing on a lot of debt and it got to this point where I was going into so much debt and I wasn’t getting paid. I went for four years without getting paid a dime by the business. I was working 80-100 hours a week, I was sleeping at the office, I was sleeping on the floor under my desk or in the lobby and it was just killing me. It got to the point in about 2007 where I said, I can't do this anymore, something has got to change. I mean, there’s something to be set for tenacity but there’s something to be set for giving up when it’s the right decision to give up too. It has just got to the point where I was like, four years of not getting paid, something’s wrong here. I've got to change something. And so, I got rid of my office. I laid off all my employees, put them all on contract and I essentially became the solo man in the business and then I have this network of contractors who are doing the work. I did that for a few years and that worked out okay and I eventually developed a relationship with one company that I was outsourcing all my fulfillments to. I was the sales and marketing guy, and then I have this partner who was getting all the work done. Well, the trouble with having a partner is you really put your eggs in one basket when you have one guy who’s doing all your work and he made a hire that didn’t work out and that hire basically lost all our clients, just ruined our business. That’s what pretty much put us under that combined with all the debt that I have brought on because I my hands were really tied because of the debt we have. I couldn’t do the things I wanted to do. That’s what took a stand so then I went out and I found a new company to outsource to and I brought on a full-time partner to handle sales for me because sales was not what I was strong at. Between me and partner doing sales, we started building up the company again and we had this new partner, but then we realized outsourcing isn’t working for us. We’re growing really fast and when we are outsourcing all the fulfillment, we just couldn’t control the quality of the work. We couldn’t control the culture and the way work was getting done and we realized we’ve got to bring this back in-house. That’s been the work that we’ve been focusing on for the last 18-24 months, is bringing all that work in-house, building our in-house team, and that’s tough work too. It’s tough to find the right people sometimes and sometimes we’ve hired definitely the right people and sometimes we’ve hired people but then we realize, “Oh, this isn’t gonna work out” And so now that we’re getting the right people in the right seat on the bus as Jim Collins talks about in “Good to Great,” we’re really noticing that things are taking off and we got this machine that’s coming along nicely now that we feel like we can scale and we want to grow a 30-million dollar a year agency here, so we’re getting those pieces in place right now and it’s looking a lot better. It’s looking good. Chris: Nice. Basically, the way that you bounced back, let me make sure I heard this correctly, so whenever you started to pull back your employees and you had quality control, so you weren’t outsourcing, is that when you noticed that your revenue number started to climb? Josh: Yeah, and so we started getting a lot of leads from the writing that I was doing and then my partner were just closing these things left and right. That what was really funneling the business to us but then we are getting the business and not being able to retain it. That’s when we started building the in-house team so that we could up our retention network. Josh: It’s no good if you're bringing in clients and then they're leaving two months later and that’s the issue we were having. We just weren’t controlling the quality there and so yes bringing it in-house allowed us to control the quality and we’ve seen those retention numbers go way up. Chris: That’s great. How did you get the gig writing for Forbes? Josh: Man, that was the luckiest break of my entire career so far. I mean, I've been doing this for 15 years and it’s been interesting. I mean, we’re a marketing firm, so you would think, “Yay, you're a marketing firm. You should be able to do your own marketing, right?” And we’ve been able to grow and we’ve been able to have good spots in the past. But when I sat down with a friend of mine and she was a PR guru and then I noticed, I was asking her, I said, “Hey, I want to get some of these badges on my website,” you know, as seen on this publication Mashable, TechCrunch, and Forbes. How do I get those badges on my website? How do I get picked up by the media? I was looking for some advice from her. I just wanted to get those logos on my website. And she said, you know, your company is not very interesting. You're in a marketing agency, so what? So does everybody else. No big deal. But she said, your story is an entrepreneur is interesting, so that’s what you should be telling. That was about 3 years ago and I started writing these articles and that just changed our business. At that point when we started, I was at that low point where were dong about $10,000 a month in revenue and we shot up to over $100,000 revenue within 12 months after I started writing for Forbes. It was just like a fire hose after that. Chris: Just by getting the gig to write and contribute articles to Forbes, you literally your business. Josh: Yeah. I mean, it was a direct result of getting on Forbes. It wouldn’t have happened without my partner doing the sales but it also wouldn’t have happened without doing that writing for Forbes. Chris: It’s amazing how looking back, you can connect the dots, but at that time, it just kind of fell into place. I think it’s great. In most entrepreneurs’ journeys, there are these serendipitous moments that happen that change the trajectory of where you're at. And I think if you're open to those things, they’ll fall in place. It’s not something that you can plan for but I feel like the more open you are to it, the more likely it is to happen and you feel like that’s kind of how this came to be as you were just open, just looking and just kind of fell on your lap. Josh: Yeah. I mean, I've looked back at that conversation I had with my friend and I think—I mean, it came down to one question. It was just me sitting there asking, “Hey, how did you get this Forbes gig?” If I hadn’t asked that question, where would I be today? The fact that I wasn’t looking to do that kind of writing but I have been blogging for 10 years and my blog had never made me a dime. I never got leads off my blog. I just enjoyed writing. But because I have been blogging, I have written like 600 posts or something over a 10-year period, so when the opportunity came along, I was ready for it. I was ready to write for Forbes. I had a lot to learn but yeah I was at the right place at the right time and that opportunity to write for Forbes led to writing for Entrepreneur Magazine and now Mashable and TechCrunch. I write for about 10 publications and now I can get into pretty much any publication I want to because I have this track records. That lead to a book deal as well, so I've got my first book coming out in March and that’s a direct result of writing for Forbes as well. It just led to all sorts of blessings. Chris: That’s great. What’s the name of the book? Josh: The book is “Chief Marketing Officers At Work,” so I'm interviewing about 30 chief marketing officers, CMOs. So I've interviewed the CMOs from PayPal, Spotify, got the CMOs from Twitter coming up, to the Home Depot. I've been able to go out and get interviews with top CMOs from these top companies and it’s going to be just all these interviews put into one book. Chris: Wow, that’s great. What advice would you give to somebody that kind of wanted to follow in your footsteps, maybe looking at college guy or a college lady today that’s like maybe, I have some college debt and I'm working a job that I'm not too happy with and I know I want to be an entrepreneur or I've heard about it like you and you said, Man, I guess I could go this route too. What’s one piece of advice that you would give a new entrepreneur starting off? Josh: No. It’s been funny over the years how a lot of my friends who went the traditional route, they went to business school and then they went to one of the accounting firms or they went to McKenzie or something and I’ll sit down and talk with them and they say, “Man, I wish was doing what you are doing. You're this entrepreneur. You’ve got your business. You have all this freedom,” and they wouldn’t tell me that during that period when I wasn’t getting paid a dime and I'm looking at them and I'm like, “I wish I had a job, man. I wish I could just get a paycheck” and so it’s funny. I mean, there’s this mentality sometimes but even when I wasn’t getting paid, I loved being an entrepreneur. I loved running the business. I did love that control and I loved that it was all on me, that succeed or fail, it was all up to me. My advice, I got some great advice when I was still a college student. I was able to interview David Neeleman who was the founder of JetBlue and I asked him that same question. I said, “What advice would you give to a young entrepreneur who is just starting out but maybe doesn’t know what he wants to do” and he said, “Dive into something and get your hands dirty. Just do something.” For him, I believe his career path was that he got a job working for an airliner for a travel agency and he just learned that business and after a year or so, he spotted an opportunity. He said, “Hey, here’s the problem and I have an idea on how to fix this problem” and he started the business out of it. I think a lot of college kids get the idea that, oh, I need to go start the next Instagram or Twitter or Snapchat or something. Well, those companies are like the Kobe Bryants, right? A lot of people play basketball, not everybody’s going to be Kobe Bryant and there are a lot of great businesses out there that you never hear about because they're only making $5 million a year or something. Chris: Everybody thinks the next unicorn billion dollar company, but there’s nothing wrong with making a million or two a year. Josh: Yeah, we’ve been just making $80,000 or $100,000 a year but having great flexibility and having a great lifestyle. In The 4-Hour WorkWeek by Tim Ferriss, I love how he says, “You don’t want a million dollars in the bank. You want the lifestyle that you think having a million dollars in the bank is going to bring you.” Well, maybe you can have that lifestyle earning $50,000 a year or something. I know a family here in Hong Kong that they got a sailboat a few years ago and they sail around the world for 2 years with their kid. Now, they didn’t make a lot of money while they were sailing around the world but they made enough to do that and how many people can say, “Yeah, I've sailed around the world for 2 years.” I mean, that’s an amazing experience for that family and a lot of people would think, “Oh, I need to earn a million dollars before I do that.” Well maybe you can start a business that makes $50,000 a year and you can do that at the same time. I just met another family here in Hong Kong that they're traveling around the world for a year, they’re living in a different country every month for one year and the guy runs a little internet business. He buys stuff and then he sells it on Amazon. It’s not a super fascinating business but he makes enough money that he can travel the world with this family and live in a different place every month. Chris: I love hearing those stories. Josh: Yeah, and there are so many of these stories out there that you just don’t hear about because they're not the unicorn story, but if you're willing to look around and find these opportunities, they're all over the place. Chris: Yeah and I appreciate you sharing your knowledge here because that’s the whole reason behind doing this show, is to show people there are so many different ways to create income and to have freedom. Last year, my wife and I actually did what you're talking about. We took a full year and traveled from Iceland all through Europe and Africa and Asia, literally went around the world and we documented it trying to show people “Look, this is possible.” There are so many different you can do this. You don’t have to be a multimillionaire to start doing this. All it takes is the desire and having some kind of lifestyle business to support it. It’s great to hear that you believe that same thing and you have personal experiences with people that have done it as well. Josh: Yeah and I mean I'm over here at Hong Kong. I live in a subtropical island and I've got these mountains right behind my house. I do trail running and I just ran out my door and ran up into the mountains and it’s just this amazing environment that I love being in and people think Hong Kong is super expensive. It’s not expensive where we live and we’ve made it work out for us and it’s just the mentality. I mean, your mind holds you back. Your mind tells you that’s not possible, I can't do that, but there are so many different ways to accomplish what you want to accomplish and I think that’s what true wealth is. True Wealth is not having money in the bank. It’s having the freedom. Here it is. There’s the shirt right? Chris: There you go. I love it. Josh: That’s what wealth is about, is having the freedom to do what you want. It’s not about the money. Chris: Yup, absolutely. Josh, do you have a book that you would consider required reading for an entrepreneur? Josh: I have a bunch of books. I love reading. I read a ton of books. I think I'm Audible.com’s biggest customer. I listen to audio books. That’s how I get my reading in. I spend a lot of money on Audible and I buy a lot of books for my company and I make all the team members read books too, so they're tired of me sending them books all the time. And so, I have different books that I live depending on the situation but The 4-Hour WorkWeek, which I mentioned, for somebody who wants to be an entrepreneur, that’s the go-to book I think. It’s a classic. It has been around for 10 years, coming up on its 10th anniversary I think this year or next year. But that is an amazing book that changed my life. I've read a lot of books where I thought this is a great book but I didn’t really do anything differently after I read the book. Chris: It’s more of a philosophy right. Good to Great was one of the first ones I read in high school and that’s what inspired me to get started actually. Josh: Yeah, that’s a great book. It’s really interesting and it’s helpful. It has helped me with some of my hiring decisions but The 4-Hour WorkWeek was a book where I read it and I set it down and said, “Wow, I am going to change everything about my business” and I did and it’s worked. It has been successful for me. I think that’s probably my first go-to books but there are so many good books out there. Chris: Awesome. Josh, do you have a favorite quote or a mantra or a guiding purpose or mission statement that kind of guides your life or that you like to live by? Josh: Yeah, it’s two words. “Everybody’s happy.” As long as everybody’s happy, then that’s all that matters. This is a lesson I learned when I was a little kid. I just realized, when you're happy, that’s really the ultimate goal. That’s the purpose of life, that’s the purpose of everything we do in life, is happiness. I don’t mean like fun, recreational-type happiness but true joy. The joy that I get from being a dad and seeing my kids grow up and be nice to each other sometimes. That’s true joy. That kind of happiness, that kind of fulfillment and satisfaction, that’s what life’s all about. So as long as everybody’s happy, it’s all good. If everybody’s not happy, then something needs to be fixed and that’s our motto in our business as well, as people come to me and say, “Hey, what should I do in this situation with this client?” and I'm like, “Make them happy.” Figure out what it’s going to take to make them happy and as long as it’s not something crazy or unreasonable, then let’s make it happen because if everybody’s happy, it’s all good. If the clients are happy, then they’ll refer more business to us and they keep paying us. If the employees and team members are happy, they do a great work and they keep the clients happy. Everything works out and everybody’s happy, so as long as everybody’s happy, it’s all good. Chris: I love it. I love it. So simple, yet so powerful. Josh, thanks for being here, man. Where can people connect with you? Josh: I blog at joshsteimle.com (J-O-S-H-S-T-E-I-M-L-E dot com) I'm also at Twitter at the same handle, so joshsteimle. Those are the best ways to connect with me. Chris: Awesome. Thanks again for being here, and guys, really really powerful lesson there. Josh, great luck on your way to $30 million. Josh: Alright. Thank you so much Chris, it’s been great.